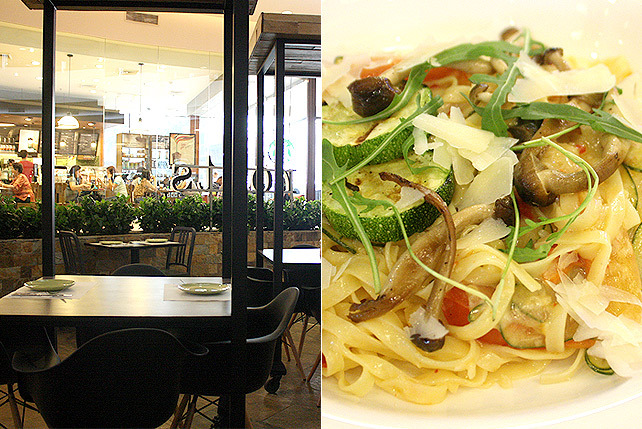 It’s a restaurant that refreshingly returns to basics. 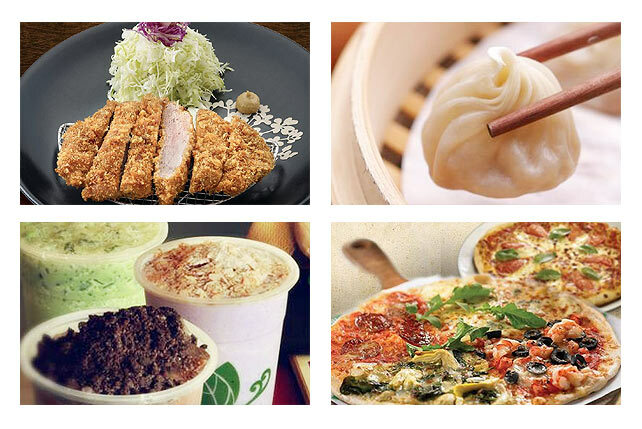 (SPOT.ph) In a culinary world of fusion and convolution, it's conversely become a refreshing sight to see a dish and confidently exclaim, "Oh that's a..." with no thought, no hesitations. Such is the case in Roots Market Bistro. 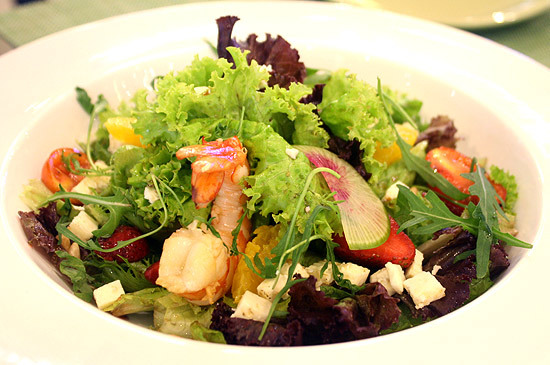 "Back to basics," says owner Bryan Tiu. "We're bringing back the flavors." Those roofs only spell a five-point word in Scrabble. Roots is in the center of Promenade's new wing. Looking very much like an indoor garden, a perimeter of shrubbery veils it from passersby while roofs made up of oversized Scrabble tiles offer privacy from the second floor (as well as a touch of whimsy). 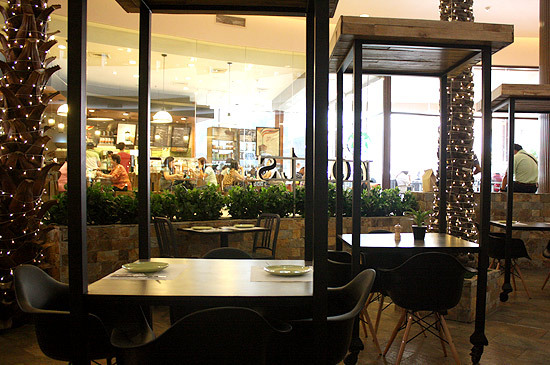 There's a little more effort in the design from what you're used to in a mall, but this is the kind of environment Tiu, who also mans Wafu, Stackers, and others, strives for-a packaged experience. 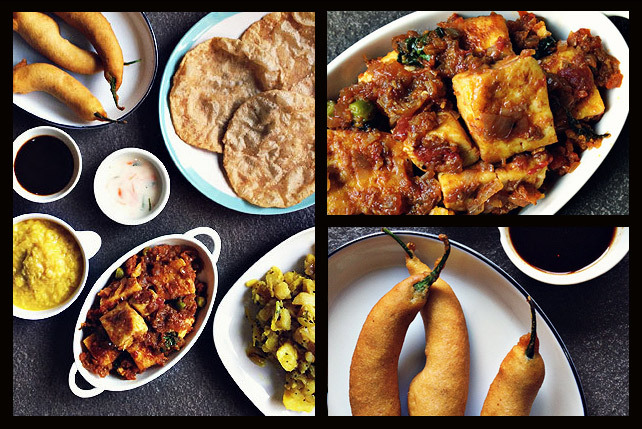 Free from unnecessary ornamentation, Roots uses quality ingredients in their cookery. Chef Chris Oronce uses techniques that highlight the natural profiles of the dish rather than obscure it. Arugula is imported from France, breads are baked in house. 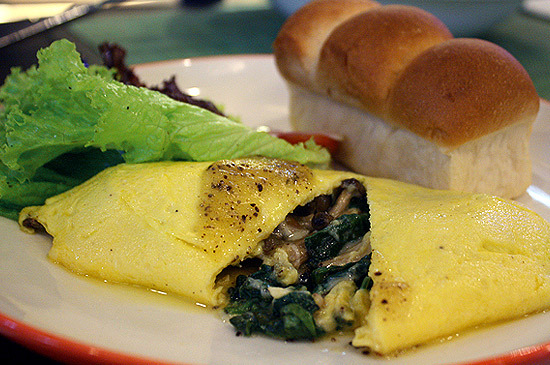 Less fussy dishes allow such efforts to shine, and the Spinach and Mushroom Omelette (P255) translates those intentions to the plate. A smooth crescent-shaped egg envelops a stuffing of baby spinach and mushrooms. Using enoki gives it a more defined flavor and complements the bitter-earthy greens. Served on the side is a buttery pan de mie that should not be ignored. The French Toast (P280) is expectedly good. 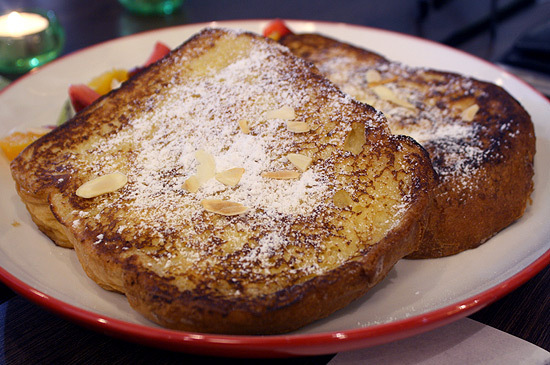 Traditions maintain the standard of this breakfast favorite, but Roots embellishes it with fresh fruit, almonds, and their own cranberry and maple syrups. Chef Chris isn't known to make compromises in quality. 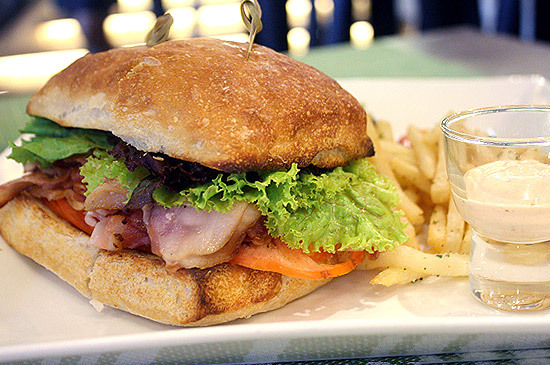 Here, the bacon is made in-house and flaunted beautifully in, where else, the Classic BLT (P365). Bacon strips piled on an inch-thick squeeze between tomatoes and lettuce fill up a crusty bun. It's a hefty sandwich that can fill up two to three people-at least. 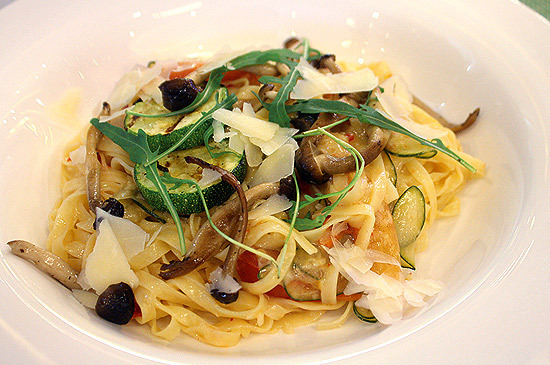 Then comes the lightness of the Vegetable Aglio Olio (P190), a stunning mélange of pearl onions, zucchini, black olives, mushrooms, tomatoes, and that arugula, over firm and chewy handmade fettuccini. There's no need for bells and whistles when you have a gorgeous chop that only needs to show off its sheer size to stand out. 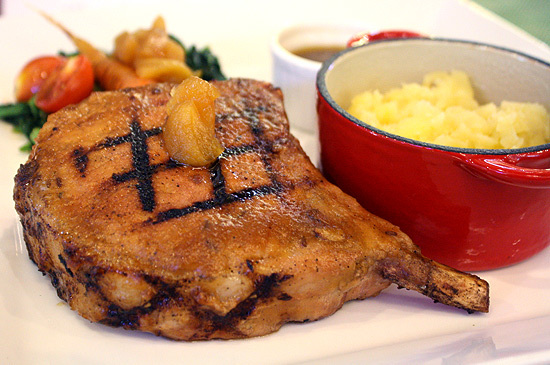 The More Than Double (Pork) Chop (P488) is a chunky slice cooked briefly in sous vide, painted with a sweet apple-infused sheen, then lightly kissed by the grill. The combination of techniques results to your knife sinking effortlessly through the hunky cut that is moist, tender, and flavorful. The sweetness from the glaze tempers the aggressive punch from the side of mustard greens, but it finds a more thrilling companion in the mashed potatoes. They're thick, chunky but without the chunks, with a delectable rustic quality to it. 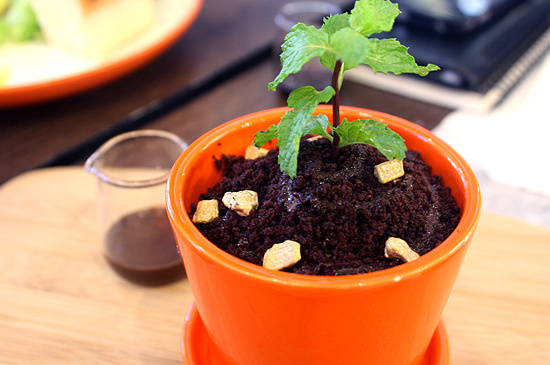 Then finally, a bit of flair-the Potted Dessert (P250), a beautiful potted mint prepped for Instagram photo-ops. A sprig of the herb is planted on a bedrock of chocolate cake, a base of vanilla ice cream sourced from Café Publico, and a toplayer of chocolate cake crumb soil. Chocolate rocks and tiny chocolate kisses make it seem more like a centerpiece than a meal. Roots is still at the starting stages, with Tiu set on developing the "market" aspect of the restaurant. But that's the most exciting part yet-when it finally blooms.